Posted by randydeutsch in Ambiguity, BIM, career, change, creativity, essence, integrative thinking, optimism, pragmatism, questions, technology. These. according to Renée Cheng, Professor and Head of School of Architecture at University of Minnesota, are some of the ways we as a profession will proceed boldly into the future. While the entire interview is generally excellent, I’d like to focus on the final third of the podcast, because these last 8 minutes of the podcast are like gold. It is not that Markku and Renee go off-script – it’s that Markku allows Renee to riff on the question of “What’s next?” in a way that we seldom hear or see in our industry media. Gratefully pragmatic without a whiff of academic jargon, what ensues in the latter part of the interview is a true dialogue, marked by a calm cadence – with much wisdom – found only rarely, if at all, anywhere. Perhaps the last time was in this video of an interview where soft-spoken philosopher J Krishnamurti asks physicist David Bohm: Would you go into your chosen profession today if you had to do it all over? Markku asks: What’s next? What developments are currently underway that you feel will have the most significant impact over the next three years? Cheng acknowledges that it is always difficult to project into the future. Renee: Things I’ve been keeping an eye on are things like crowdsourcing. I don’t know if you’ve heard of the Netflix competition? Renee: Crowdsourcing, where you can put out a query and get multiple minds working on it. Not like a wiki where you can let anyone post but more like invited experts working in somewhat of a hierarchy, somewhat of a system. Cheng went on to describe how her school has run some studios based on social networking platforms. Renee: We’re going to start to get some pretty highly specialized people that need to be brought in at very specific times and not end up having everyone in the room all the time. So if there can be some way to streamline some of that – how to keep communication going without necessarily having everyone be face to face. But isn’t face to face collaboration critical to the successful outcome of a project? Renee: The more I’m getting into this the more I am realizing that face to face is a really critical part of this. And yet there are huge opportunities for virtual interface. So how do we as humans overcome the fact that face-to-face is still the best means of communication? And how can some of these virtual environments or virtual tools begin to – not replace – but supplement it, potentially making things go faster and involve more voices? That is something I will be looking for in the next couple of years. Markku: I’m curious to hear you expand just a little bit on what you perceive as the role of the designer in this new future that may involve much larger numbers of stakeholders input into design. How do you think that crowdsourcing and other trends you describe will affect the role of the designer? Renee: There’s a utopian and dystopian way of looking at this (laughter.) In the dystopian way architects become just one of many, many voices. The hierarchy is lost and it becomes very difficult to get good design. You just get a lot of compromise. That would be the dystopian future I would not like to see. Renee: The utopian future that we are trying to prepare our students to lead and for this role is architect as – in some kind of manner of – not necessarily master builder but potentially something more in the Kieran Timberlake model, the central figure, the connector – someone who can be the advocate for design. And for design thinking. Can think laterally and simultaneously. And can help others to make decisions that make sense. Ideally there is some role for the architect that is different than the role of any other experts, clients or users – or whomever is adding to this future design process – that are coming in. Because of the training. Renee: The training is not that they know how to make a zero-energy building. Or that they know how to manipulate a BIM model. The training is that they know how to see things laterally and simultaneously. Renee: Very few people know how to do that. And when you can see things laterally and simultaneously, envisioning multiple options at the same time, you have an enormous ability to redefine the problem, reframe the questions and direct people’s energy. Renee: So that’s what I would hope would set the architect apart from others in the crowd. As crowdsourcing or social networking or larger number of stakeholders begin to be part of the process. Markku: The ability to position the conversation within a framework of multiple, possible realities. Renee: Exactly. And to be able to frame and reframe the questions. Because it’s not about trying to find answers or solutions to things. It’s really about precisely defining the problem – and then the solution becomes self-evident. And any designer who has had that moment happen – or visited a building where it all comes together and makes sense – that solution didn’t come from someone saying “make this museum function in this and this way.” It came from a variety of things that were juggled at the same time. A lot of tangible and intangible things that get fit into that process until you reach a result that is so beautiful and well-designed it becomes inevitable. But it wasn’t from trying to solve a problem. It comes from framing the questions. Markku: Do you think that that ability to frame the problem in such a concise way that the solution becomes self-evident is possible in the realm of the academy? Renee: we’re trying to develop and nurture that skill in our students. It’s both a blessing and a curse to have this ability to constantly frame questions and prolong the period of not jumping to conclusion or solution…If we’re asked to prepare students to meet these grand challenges that are coming forward for their generation, then we’re going to need to think about how we’re going to instill all of these skills that we’ve always counted on architects having, yet prepare them for a future that is extremely different than we knew when we were in school – or that’s even existing today. It’s a tough thing for a curriculum to do. A challenge that I would say architectural education has not faced ever before. Markku: An interesting time for you. Renee: It’s always good to be living in interesting times. Sometimes I do wonder how we’re going to get there. The creative thing is when you go into the studios and see the students and how enthusiastic they are in accepting the goals of carbon neutrality and low energy design and just aggressively and idealistically tackling them. And very, very thirsty for the tools that will allow them to get there. I don’t think, in student’s idealistic minds, they’re thinking of the billions of dollars cut from waste in the building industry. They’re thinking of a future where all buildings are efficiently built, with a good use of resources, hopefully with well-compensated designers and clients that are knowledgeable and willing to take risks on things that are willing to move the technology forward and buildings forward. Communities that are livable and walkable and promote healthy living. Students are aiming for the moon – which leads me to think it is a tough problem – but that’s our role as educators and our role as professionals. To show them that yes it can be done. And that we’re just taking it step by step. Markku: Well I think we’re in great hands. 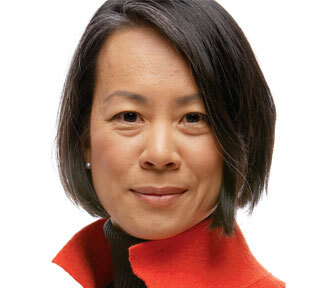 Renée Cheng is a graduate of Harvard’s GSD and Harvard College. A registered architect, her professional experience includes work for Pei, Cobb, Freed and Partners and Richard Meier and Partners before founding Cheng-Olson Design. She taught at the University of Michigan and the University of Arizona before joining the faculty of University of Minnesota in January of 2002 where she is currently Head. Professor Cheng has written on the topic of architectural education in the context of emerging practices and technology. These writings have appeared in the 2006 AIA Report on Integrated Practice and the Education Summit at ACADIA in 2004. 2006 “Suggestions for an Integrated Practice” in AIA Report on Integrated Practice, ed. Norm Strong, Daniel Friedman, Mike Broshar, also excerpted in AECBytes, Viewpoint July 2006. Look here and here for more on IPD at AIA. Look here for the AIA’s review of 2009 and Beyond | Revisiting the Report on Integrated Practice, “Suggestions for an Integrative Education,” by Robert Smith, AIA. Each essay from the 2006 Report on Integrated Practice is being re-released as part of the 2009 and Beyond series. The re-release includes new commentary as well as podcasts from interviews with the reports’ original authors.